It isn't long now until one of my favourite periods of the year - PROM SEASON! Last year, I celebrated my Year 11 prom and had a fabulous night. However, I would most definitely say finding the perfect dress, getting together complementary accessories and buying new makeup was the highlight of my Prom experience. Fortunately, I found my dream dress in the first shop I looked inside - it was a little local shop in a village close to my town, 'From Dusk Till Dawn'. My dress was a beautiful pale pink with thousands of beautiful gems embroided on the top half; it was literally the exact style of dress I had been pinning on pinterest months before I went shopping. I was extremely lucky to find it...and today I've come across a very similar gorgeous dress, along with others, to inspire your prom dress shopping experience. Stay tuned until the end to find out my tips on finding the right dress for you! Elegant A-Line Long Chiffon Scoop Pink Evening Dress - Starting off with the dress similar to mine, this stunning chiffon number is perfect for those with a girly style and who also loves anything with glitters, sequins or jewels. If you're looking for that elegant entrance, this subtly striking outfit will grab lots of attention. Mermaid V-Neck Long Sleeve Mermaid Dress - Oh how I wish I could pull something like this off!! Girls with long legs would look incredible in this sensual, flesh-showing masterpiece. I also feel that those with lighter coloured hair would suit this black dress, as the contrast in colours would draw attention to your locks. Also, I'm a huge lover of the floral/lace detailing on one arm. 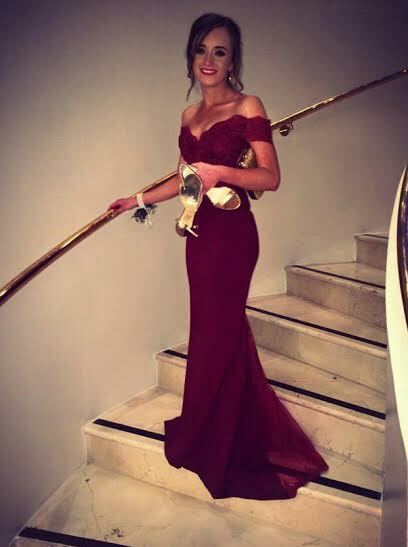 Off Shoulder Mermaid Long Burgundy Chiffon Prom Dress - This tight-hugging prom dress is fabulous for defining your figure; the long mermaid style dress creates a wonderful pool of deep burgundy as it hits the floor. Additionally, the off-shoulder feature creates the ultimate classy look which would in sync with a wonderful jewelled necklace. 1. DON'T - have a specific idea of what you want, otherwise your hopes may be shattered. Instead just choose maybe a colour or style of dress that you like and go from there. 2. DO - try as many different styles as you can, you want to find the style that you think looks best on your body. Also, it's so fun trying multiple gorgeous dresses on, so make the most of it! 3. DON'T - buy online from a store that does not offer free returns. Some companies send dresses that don't look ANYTHING like the image or the sizing could be a major issue. 4. DO - bring along people who you trust and are willing to give an honest opinion on what you look like. 5. DON'T - buy any accessories or shoes before finding your dress. You never know what you end up liking until you've actually physically tried the dress on for yourself. This post was in collaboration with Simple Dresses, however all opinions are honest and my own. She looked outstanding in this prom dress!! Red carpet glam was absolutely great. I also want to try that red dress for wedding of my sister. She has booked really classy wedding venues Los Angeles and I want to look at my best.